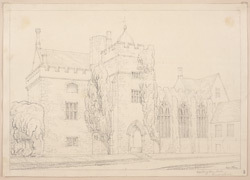 This delicate pencil drawing is of the exterior of Dartington Hall in Devon. Dartington Hall is one of the most spectacular medieval houses to be found in Britain. It was built between 1388 and 1400 by John Holland, half-brother to Richard II. Although Holland was later executed for plotting against Henry IV, the family continued to reside at the house until 1475. The property was then occupied by numerous owners and tenants, one of the most eminent being Margaret Beaufort, mother of Henry VII. The site is made up of a collection of buildings that surround an enormous courtyard. The magnificent Great Hall, which is located on the south side, possesses a huge fireplace; the timber roof has finely carved corbels.